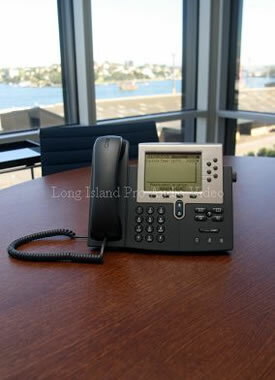 Long Island Pro Audio Video - Audio Video Sales. 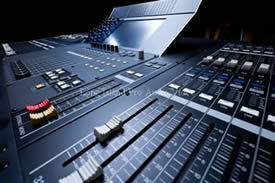 Audio Video Service. 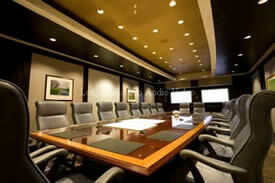 Audio Video Installations. Audio Video Rentals. Long Island Pro Audio Video specializes in custom audio and video solutions for both commercial business professionals as well and / or residential clients by providing expert sales consultants, experienced service technicians and installation specialists for all of our customers. We cater to every one of our individual clients depending on their particular needs, their specific budget, and their personal tastes and preferences. 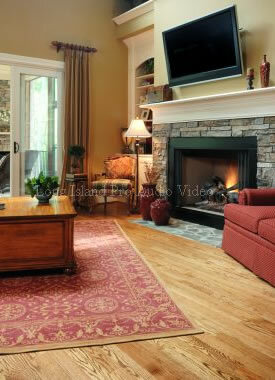 We believe that every install should be customized just as every customer, home and / or business is unique. 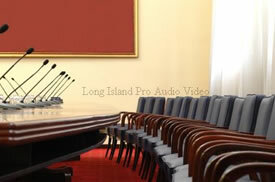 Long Island Pro Audio Video ensures our reputation as well as our client's piece of mind by providing them with the security of knowing that all of our services and installations are fully insured. From the moment we enter your home or business to the second we walk out, Long Island Pro Audio Video takes every precaution of securing your household or business from unexpected incidents - treating your home or business as if they are our own. 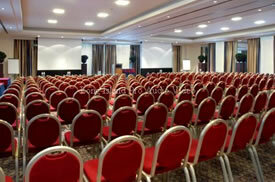 We take care of our customers before, during and after the sale and or installation. 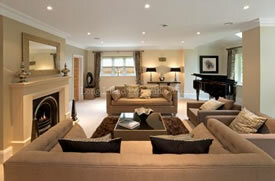 When it comes to your own home residence or your own commercial business, why would you trust anyone else? For our Residential customers, Long Island Pro Audio Video proudly services all of Long Island  both Nassau County and Suffolk County for all of your home audio and video needs. 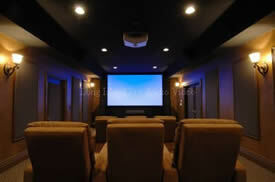 From Home Theater Design / Media Room Installations to Whole House Audio and Video Systems, Long Island Pro Audio Video handles all of your homes needs. We also specialize in Home Automation and HDTV Flat Screen Mountings as well as utilizing our unique Built-Invisible Speaker Systems. Our enhanced Universal Remote Controls / Remote Keypads and advanced Voice Over Internet Phone Systems (VOIP) ensure that you are equipped with the latest in technology that is easy to understand as well as easy to use. As always, we make sure you know how to use your equipment properly by showing you in detail before we leave any job  big or small. Wherever possible, Long Island Pro Audio Video will hide all wires during the New Construction Pre-wire phase and in old construction by snaking and running wires neatly inside the walls of your home or residence. For our Commercial business customers, Long Island Pro Audio Video professionally services, sells and installs high-grade Commercial Projectors and professional-grade Projection Screens for your corporation or business office. We also offer Public Address Systems (PA Systems) for your restaurant, small retail business or large firm, as well as provide Network Cabling to keep your business up to date with the latest in communication technology. In addition, we offer Commercial Business Phone Systems for companies that need an intelligent or smart phone system to help run their business efficiently and effectively. Also be sure to ask about our Intelligent DJ Lighting and Stage Lighting for your club or restaurant. 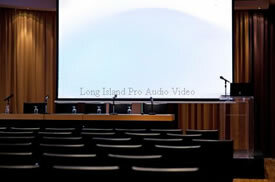 As an additional service, Long Island Pro Audio Video can also provide On-Site Audio Video Rentals for your next corporate event or business meeting. Unlike other rental companies that rent out old, used equipment that you would have to pick up and install on your own, Long Island Pro Audio Video will deliver top-notch equipment right to your site and set up all wires as well as make all the necessary connections, checking out and setting up the equipment the right way. The Audio and Video equipment we use is state of the art and looks just as impressive as it sounds, so we only offer on-site rentals to ensure quality and service. For added value, our Live Sound Production offers our business clients a staff of trained individuals at your service to help produce your event effectively  this way you and your clients can concentrate on your presentation. 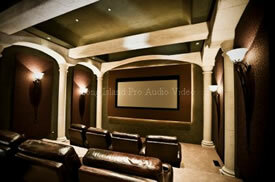 Customer satisfaction is our main concern here at Long Island Pro Audio Video. On all of our projects both large and small, we offer a lifetime guarantee on installation for all of our customers. Extended warranties are offered on all the products we sell as an added service and value to our customers. This ensures all of our customers that their hard-earned money will not only be put to good use in the first place, but also carries on through the life that they own the products we sell and install. This is just another way Long Island Pro Audio Video not only provides customer satisfaction during your custom audio video installation but also guarantees customer satisfaction for many years to come! 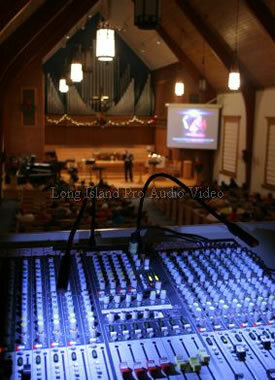 © 2011 - Long Island Pro Audio Video - All rights reserved.